Live the vacation life to its fullest at this upscale Brasada Ranch home with amazing views of the eighth fairway! Surrounded in all directions by sweeping High Desert terrain, this dog-friendly vacation home includes a superb array of amenities, from a private hot tub to on-site tennis, volleyball, swimming, and golfing. Comfort has never been so easy! After an exhilarating day outdoors, head back to this cozy rental for a quiet night of relaxation. Enjoy a refreshing soak in the hot tub or sip a glass of wine on the deck, where you can take in the fresh air and the rich colors of a desert sunset. 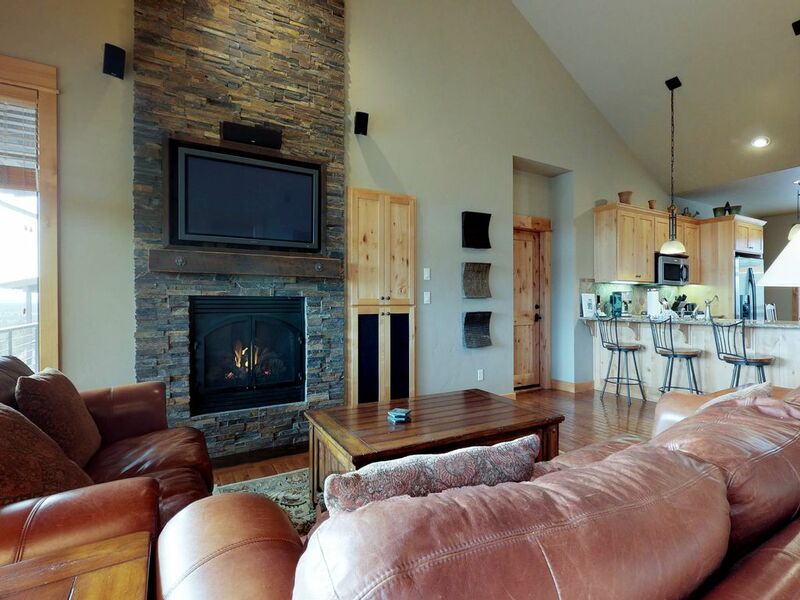 When you get hungry, fix a hot meal in the fully equipped kitchen and curl up in front of the gas fireplace for a movie marathon or family game night. Free WiFi lets you keep up with all your friends back home, and the master bedroom even has a private fireplace and kitchenette, so you can keep warm and full on those cold winter nights. Book your stay at this delightful Brasada Ranch vacation home for a Central Oregon retreat you'll never forget! * Please note that there is a mandatory $25 per day per person resort fee for all guests age six and older that allows access to the pool and other property amenities.. This charge will be collected before you arrive at the resort by one of our reservationists. Parking Notes: Please park in the spaces marked for cabin 82. The overall experience with cabin 82 was positive. The cabin is clean, comfortable, nice views has pretty much all you need, not really agreeing with other reviews, regarding supplies towels etc. As we've used VRBO for other properties you must know going in that you need to supply some of the basics I.e. laundry detergent, spices for cooking etc. The only issue we found was the cooling wasn't working but wasn't big issue as we weren't in the cabin during the day and evenings cooled enough. Do agree that hot tub needs some maintenance.